Anthropologie has a nice little promo for us this weekend. With code SURPRISE you can take $20 off every $100 you spend. There are a lot of fun things to choose from and I’ve been looking at all the pretty blouses that Anthropologie has in abundance. During the 20% off a few weeks ago, my store had a Style Event.  I was able to try on, and buy, a few things for the upcoming Spring and Summer. 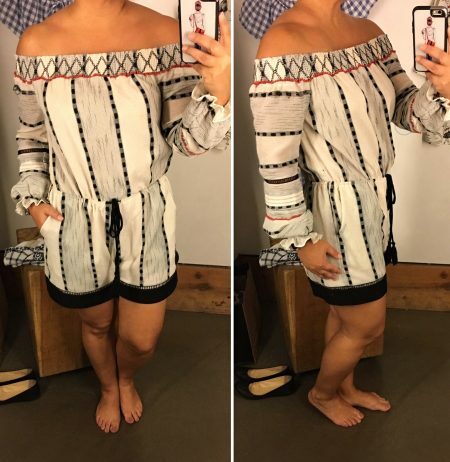 I really liked the colors and pattern on this OTS Romper. It originally felt a little like a heavy linen but the material is questionable, and hot, with a mix of poly/wool/cotton and a poly lining. The small fit well and the shoulders seemed to stay put as I moved around. I can see myself looking at this again when it goes on sale. I find that I size down in Bailey 44 items usually so it’s TTS for the brand. I liked the concept of the twisted hem and it fits fine but seems a little boring, even with the twisted hem. I have plenty of tees but this is on sale plus an additional 25% off. This is a really flowy blouse and I feel because of that it does run big. I originally tried on a Medium and was swallowed up in it. 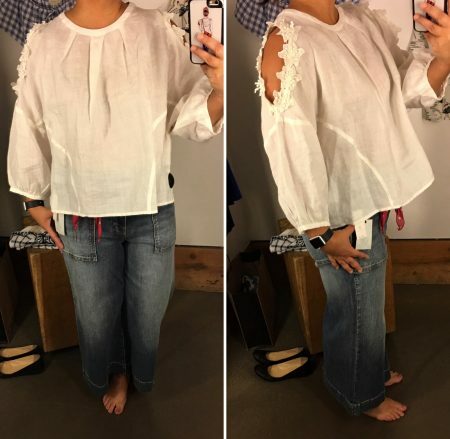 The Small fits better but still flowy through the body. 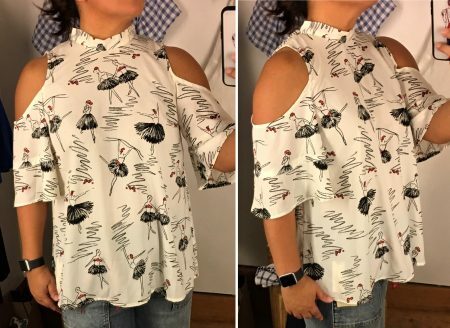 I like my OTS blouses I have but was a little leery of the “cold-shoulder” or “open-shoulder” ones. I liked this one and did find another I loved even more. I’m on board with this trend for the Spring and Summer! I grabbed this to try on because I liked the embroidery on this but it runs wide and is over-sized. Drop down one size for this top. The price is right for this top and I would take another look at it when it goes on sale. 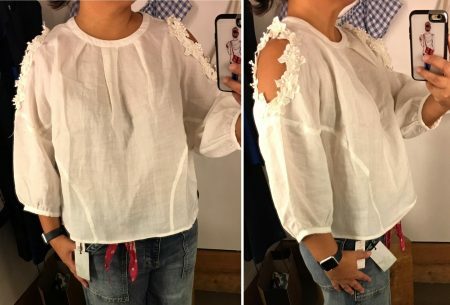 Bonus that it is lined through the body. 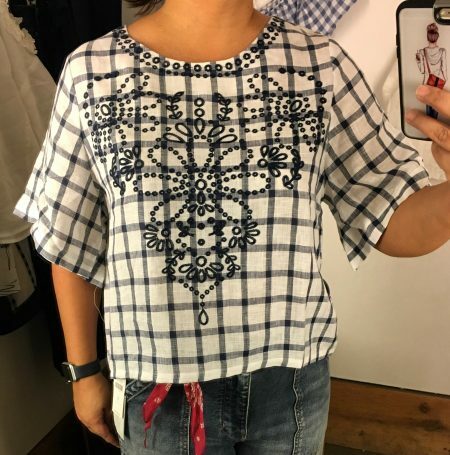 I loved this blouse on the hanger and once I tried it on. 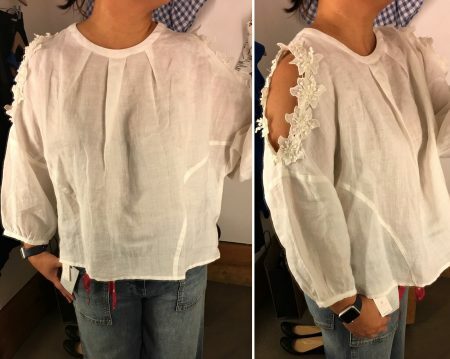 The detail at the shoulder and arms are so cute and it’s made of 100% Linen, which I love for Summer. The only issue was I felt it was still a little big in the Medium. 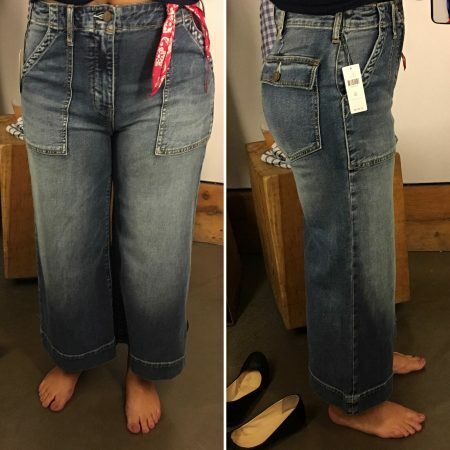 You know I love wide-leg anything and I had to try these on. They also fit pretty well but I felt they had enough stretch in them that I could try sizing down. That little red bandana comes with the jean and is re-moveable. The Small is still wide and blousy, and I know you can’t really tell, but it still fits a lot better than the Medium. 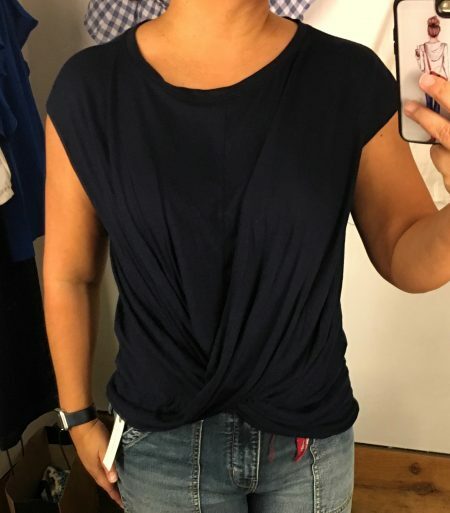 I find it comfortable but chic and have already worn this a few times, including taking it on my Vegas trip last weekend. I tucked in the front in jeans to give it a little more shape. I also like that I can still wear a normal bra and not a strapless one. Reviews on this are not good at all but I guess I am the exception. So much that I will be getting this in the Mango color as well. I see myself wearing both quite a bit from now until Fall! 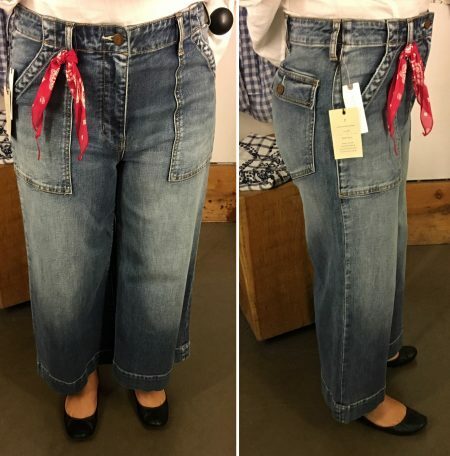 The size 28 is a much better fit due to the stretch and high-waist. I love the wide-leg and they are cropped on me. YAY! I bought these as well and have worn them with the Floral Texture Blouse a few times. I really love my two purchases and can’t wait to wear them again. I know this SURPRISE promo isn’t much, as 20% off would be a lot better, but it’s still something, right? What’s caught your eye at Anthropologie lately?